LOCATION.--Lat 40`57'29", long 76`37'10", Montour County, Hydrologic Unit 02050107, on right bank 500 ft upstream from Mill Street bridge on State Highway 54 at Danville and 0.8 mi upstream from Mahoning Creek. Water Quality monitor is located about 1.1 mile upstream, at Lat 40°56'50", long 76°36'16", in pumphouse for Danville Water Authority. PERIOD OF RECORD.--March 1899 to current year. Prior to April 1905 monthly discharge only, published in WSP 1302. GAGE.--Water-stage recorder and water-quality monitor. Datum of gage is 431.29 ft above National Geodetic Vertical Datum of 1929. Prior to June 29, 1939, non-recording gage at or near Mill Street bridge at same datum. 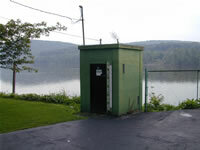 Since Oct. 1, 1971, water-stage recorder for Susquehanna River at Sunbury (station 01553990), used as an auxiliary gage. Satellite and landline telemetry at station. Water-quality parameters at this station can vary substantially at different location in the river. Therefore, water-quality data displayed here characterizes conditions only at the location where water-quality equipment is deployed. Supplied by NWS: Action stage-15 ft; Flood stage-20 ft, inundation begins in Riverside on the left bank; Moderate flood stage-23 ft, flooding occurs at the State hospital grounds on east side of town. Backwater produces flooding on Sechler Run in center of town; Major flood stage-30 ft, much of Riverside on left bank is affected by high water; water levels approach pump station on right bank just downstream of highway bridge.